If you want a reasonably priced, light zoom for Nikon this is a good option. I find the pictures to be sharp and to have good colour- and it is certainly easy to take along on a trip. 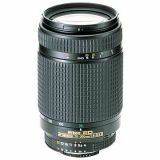 If I compare with the results from my 80-200mm f/2.8 AF ED Nikkor, it can't really compete- but that one is a lot heavier and of course more expensive. This lens is reputably better optically than Nikon's newer 'G' version and it certainly has a much better build quality, though many say it is actually made by Tamron. I'd call it a mid-level lens and I am happy with the results, considering it gives me a 300mm lens that I can stick in my backpack.